Manchester is one of England's leading industrial cities and it was world-renowned for technology and science during the Industrial Revolution. You can learn more about the technical and scientific developments in England and Manchester at the Museum of Science and Industry, which is Manchester's largest museum, located in the heart of the industrial section of the city. Here you can see old department stores and bridges to different means of transport, such as cars, aircraft and railway locomotives. You can also learn more about the science behind, for example, DNA and 3D. The museum's main body is located at the place where the world's first railway station was built and on certain days there’s the opportunity to ride steam trains outside the museum. Sankey's is the party place to go to for those who like techno, electro or any other kind of electronic music. Big DJ names from all around the world come here, and there’s always a good buzz and a lot of people when the club is open. Sankey's is perhaps Manchester's most popular nightclub and electronic music enthusiasts from all around the world come here. Well-known bands like Daft Punk and the Chemical Brothers started out playing at this legendary spot. After wandering around the streets of Manchester, it may be time to sit down and re-charge your batteries in order to deal with the rest of the day. 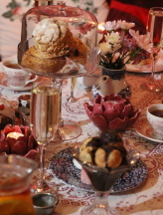 You can settle down at Richmond Tea Rooms for some refreshments in a very unique setting. The special thing about this café is the fact that it's decorated in the Victorian style with a lot of colour and different details. The interior can be compared to the film sets in the film ‘Alice in Wonderland’. Just going into Richmond Tea Rooms is an experience in itself and it's definitely worth a visit after a day on the city streets. 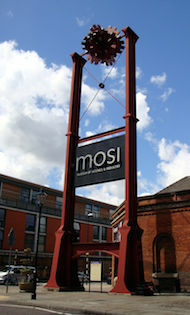 As in most cities, there are both small and large museums in Manchester. One of the smaller ones is the Greater Manchester Police Museum, which is a museum full of interesting information about police work in Manchester throughout history. Here you can hear the old police stories about what took place on the streets and you'll have the opportunity of seeing and trying on police equipment from the past. The museum is located in an old police station and the entire interior can still be seen in its original condition. A visit here definitely gives a feeling of going back in time! Whether you're a shopaholic or not, you shouldn't miss a visit to England's largest shopping mall, the Trafford Centre. Most of what can be purchased in life is here and this shopping centre is a place to spend a good few hours, with 280 shops. There are plenty of other things to do, like going to the cinema or eating some great food, for those who don’t like running around the shops. The shopping centre has Europe's largest food department with a total of sixty restaurants and room for 1600 people. Just outside of Manchester city centre you'll find Aerial Extreme, which is a climbing park with obstacle courses in the air. You're definitely up for a good adrenaline rush when you make your way up among the treetops while trying to keep your balance, or riding the cable car at full speed. A day at Aerial Extreme will likely be the most action-packed day in Manchester. It’s very safe, and both adults and children can visit this exciting climbing park. In the heart of Manchester you’ll find the Royal Exchange Theatre. In this award winning theatre there have been over 125 premières with performances from, among others, William Shakespeare, Tennessee Williams, Oscar Wilde, Noel Coward and Anton Chekhov. Something that is unique to Royal Exchange Theatre is the circular stage that allows the audience to see from all angles and only nine metres away from the stage. Information about current performances and tickets can be found onsite or online. Castlefield Urban Heritage Park is an area in the central part of Manchester where you will find several historical monuments from different eras. What stands out most is the ruins of the Roman empire that remain here. The name Castlefield actually comes from a fortress from the Roman Empire which translated into English was called "Castle in the field". 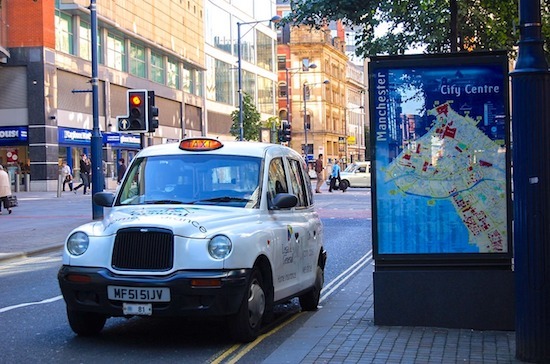 According to archeologists and researchers, Castlefield was the first populated area in Manchester and when you visit this area you'll be able to see several remains from the early settlements. Something else to admire is Castlefield's canal system, built during the industrial revolution. The channels are spread throughout the area and along the edges in particular you'll see barges and smaller houseboats. If you visit Castlefield on a Sunday, don’t miss visiting the market where you can find mainly retro and vintage, as well as several kinds of food. There are also good opportunities to dine at any of the restaurants or pubs. A nice pub that serves good food and offers several different beers is The Wharf. 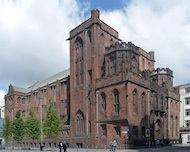 A fantastic building that is well worth taking a closer look at is the John Rylands Library. This library was built by John Rylands, who was one of Manchester's most successful industrialists in the 1800s. At first glance it may be difficult to understand that it’s a library, as the design rather resembles a cathedral or a castle. The architecture is a beautiful Victorian Gothic style—both inside and outside of the John Rylands Library is mighty magnificent. Inside the library, there are several interesting historical objects with everything from the oldest copies of the New Testament to several manuscripts from the Middle Ages. If you are interested in history or architecture, should you really be sure not to miss a visit to this special library. The National Football Museum is a large museum that is dedicated to everything to do with football. In total, there are six floors full of exhibitions of football and its history. In addition to all the different football exhibitions, you’ll also find a number of activities such as games, penalty shoot-outs, various tests and much more. Whether you are a football fan or not, there is a good chance that you will appreciate all the interesting information and trivia that you can learn about the sport. If you should happen not to enjoy the visit, you can at least rejoice that it didn't cost anything. It is completely free to enter the National Football Museum. An excellent place to visit for adults as well as children is the Runway Visitor Park. This is a great museum looking at Manchester Airport where you can take part in everything related to aircraft and air traffic. Among other things, you can see the superspeed Concorde and several other large aircraft. The different guides give briefings on the technical equipment and visitors should go into the cockpit to learn all about how a pilot works. There is also the chance to sit on the airplane seats where world-famous people like Michael Jackson and Nelson Mandela have been. Because the museum is located out by the airport, it also offers a full view of all of the approximately 600 flights a day that arrive and depart in Manchester. The Bridgewater Canal is England's oldest canal and was built in the mid-1700s after the industrial revolution had begun. It was in 1759 that construction of the canal began by the then Duke of Bridgewater, John Gilbert and James Brindley, to primarily transport coal from the coal mines in Manchester and out of the country. It was also on this canal that the world's first steam-powered boat tests were run and later began serving the Atlantic and eventually the Mississippi in the United States. Previously, the canal was known for the water that was completely orange because of the iron ochre which leaked from the underground canals in the area. Much of this was cleaned up and later removed to improve the environment and bring back wildlife around the canal. In total, the channel is sxity-seven kilometres long and passes through several small towns in the Manchester area. There is a lot to explore around the canal. The environment in many places is very beautiful and there are several fascinating older buildings along the waterfront. The best way to discover the canal is on a bike or by boat. Bicycles can be rented at several places inside Manchester and there are many cycle paths along the canal. If you choose to go boating, there is the option to either rent your own or join one of the various boat trips that depart from Manchester city centre. After visiting various attractions around the city, it’s nice to relax amongst some fresh air and greenery. One of the best places to do this is the Fletcher Moss Botanical Garden. Here you can stroll along the park's various paths among beautiful flowers and plants. The environment is very peaceful and in several spots there are places to settle down in order to just take it easy for a while.